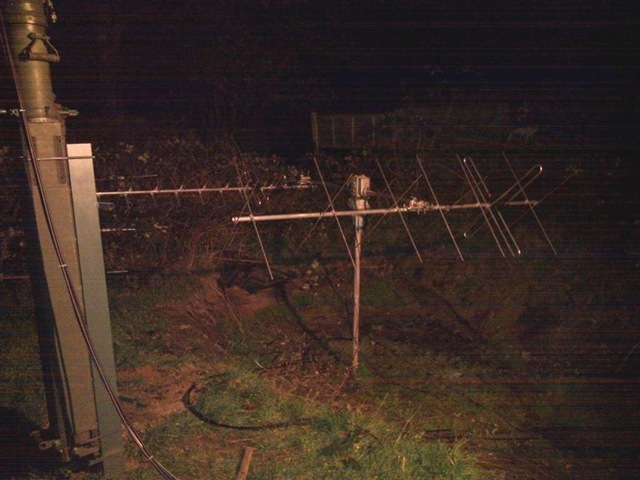 Following on from the previous satellite antenna posts here is an update on what happened after the antennas were received. At first I wanted to build cross yagis for 2m and 70cm as the HyGain ones I had previously seemed rather poor in terms of performance. I hunted the web for some designs and couldn’t find anything – I then thought I’d look for simple non crossed yagi designs which had boom lengths around 2m then modifying it to be crossed but again it was hard to find anything decent. As the antennas will be used on the Arran DX’pedition I also had reservations about using a design not specifically based around a cross yagi or built for the satellite portion of the band. 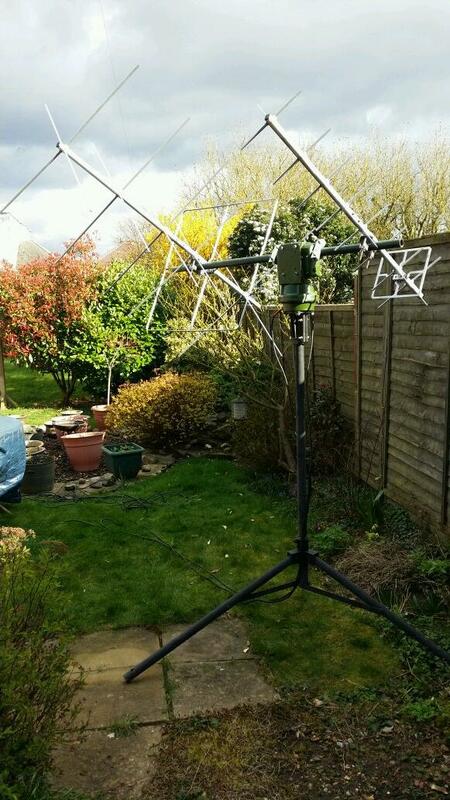 I then looked at the UK retailers to purchase satellite antennas and again nothing which met my requirements! Thankfully I bumped into previous dx’peditioner Geoff DDX one morning on the local Cambridge CRG repeater GB3PY who told me Brian G6HFS had recently purchased some and I should speak with him, well a phonecall to Brian and I was on the Wimo website, Wimo are predominantly an antenna and antenna systems company in Germany http://www.wimo.com/. Having a look on their site I found exactly what I needed! Pretty much the same as what Brian ordered! 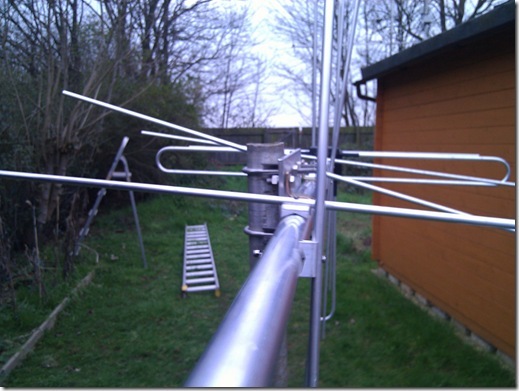 In the end I ordered a 7 element cross yagi for 2m (10dBd) and a 10 element cross yagi for 70cm (11.5dBd) plus a phasing harness for each to allow circular polarisation, fitted to allow right hand circular polarisation. Well the antennas arrived from Germany 2 working days after ordering and off I went to build them, 2m first then 70cm. As I started on the 2m one it soon became apparent that the holes drilled for the directors were done incorrectly. The boom comes in 2 parts, the front and back (joined at the mounting point in the middle) and even my housemate who came out to help noticed the holed were miss aligned. I ended up re-drilling the mounting holes to get it back to being level. I emailed Wimo on this and with no quarrel they are sending me a new boom section over to replace this one. Wimo are known for their quality so I’ve no idea what happened here – but their customer service is spot on! Due to the 6m UKAC on Tuesday and the Arran planning meeting on Wednesday I only got round to mounting the antennas last night. They are not very high, about 4 feet up, and they sit in part of the old pond next to the shack well below the bushes, shack, SCAM antennas etc, this is them pointing about 330 degrees. The elements are mounted to the boom direct (and electrically) with a single 50mm M3 cross head screw and nylon insert nut. Fine for permanent installs but fiddly and such like for going /P, i.e. Arran. So this week I got off eBay I got some 50mm M3 hex head screws and M3 wing nuts which will allow disassembly and transport much easier, something we again struggled with with the old HyGain antennas.